Good intonation. Nice build and finish. Respectable plugged-in tones. Few setup issues. Expensive, for a cigar box guitar. While the rock world seems to be creating more and more extended-range instruments, those of us working in the acoustic world might well be looking for fewer strings. The four-string tenor guitar is making a bit of a comeback and there are a host of fewer-string 'folk' instruments that can all add texture and interest to your music, either live or recorded. And that's where this neat cigar box guitar (CBG) fits in. For many, a CBG is a simple, DIY instrument that's ideal for old- style gnarly blues and slide. There's nothing wrong with that, but St Blues has made this one properly, which extends its use considerably. "Once set correctly, the overall intonation was really very good"
By design, a CBG is a simple beast. The long, thin neck has a Fender-style head, decent Grover tuners and a nicely cut bone nut. Fretting is very good and although the neck profile is pretty square, it is nicely finished. There's no bridge as such, just a bone saddle held in place by the string tension. But once set correctly, the overall intonation was really very good, making upper-fret chord voicing sound a lot more in-tune than many cheaper CBGs we've played. This one is also electro, via a custom piezo transducer mounted in the cigar box body, with a side-mounted volume control and jack output. We even get proper strap buttons, too! Designed to be tuned to 'open G' (G, D, G, B), the St Blues is supplied with a custom D'Addario string set, a 0.045 wound bass string, a 0.026 wound, then 0.017 and 0.013 plain top strings. Of course, you don't have to stick to this tuning, or the string gauges; raising the top two strings was easy enough to produce a 'fifths' tuning - G, D, A, E, like a tenor guitar, banjo or mandolin. Whatever tuning you choose, you'll have to get used to the odd feel - strapped on, it's very unbalanced but light in weight, so it's actually quite easy to hold it in place and play, either standing or seated. Unplugged, there's enough volume for practice and, plugged in, while the body becomes very microphonic, albeit handy for right-hand percussion; the sound is really quite acoustic-like with a little banjo-like ping and percussive attack. Lower tunings slacken the string tension and induce a slightly more Eastern flavour, or more African desert blues-like tonalities, especially into a lightly crunchy valve amp. If you're into your roots and world music, it's a very useful tool, not least if you play slide - the supplied setup is a little low for that, but the bridge saddle can either be shimmed or you can just move it upright. 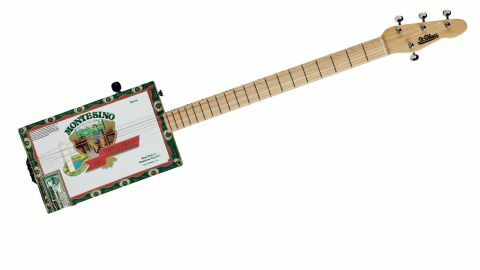 It's far from the cheapest cigar box guitar out there, but it's the best one we've come across in terms of build and playability. Certainly if you're interested in exploring a slightly left-of- mainstream musical world, it's far from a daft choice. Oh, and you have a choice of different brands of cigar box, too!